in Startup News with tags 3d printing, ces, dash, freer logic, gamestick, leapmotion, makerbot, startups Both comments and trackbacks are closed. 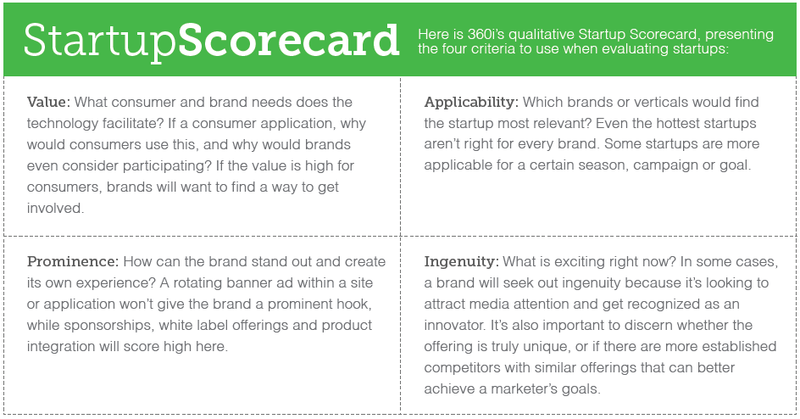 Welcome to the first 2013 edition of Startup Outlook, 360i’s guide for how brands can evaluate emerging technologies and platforms. This month’s edition is inspired by the Consumer Electronics Show (CES), where thousands of marketers were among the mob of 150,000 participants converging in Las Vegas to experience the latest in technology and media. While this issue features five very different startups – Dash, Freer Logic, Gamestick, Leap Motion, and Makerbot – all five are hardware companies that brands should keep an eye on to understand a range of emerging trends, including gesture controls, telematics, 3D printing and brainwave scanning. *****Each Startup Outlook measures five select companies against the evaluation criteria outlined in 360i’s Startup Scorecard. * Value: Dash is a location-based mobile software company creating what it calls “the automotive graph,” built around a piece of in-car hardware. First, drivers must buy a standard $15 On-Board Diagnostics (OBD) device that plugs into a socket found in every car sold since the mid-1990s. The OBD plug is the same kind that some insurance companies now use to monitor and incentivize drivers. Dash has built an app, live for Android and coming soon to iOS, that pairs with the hardware and monitors not just the OBD data but also traffic, the music played, and other sources. Dash can take all this data to provide many different kinds of value for consumers, including: visualizing trips, sharing trip summaries with friends, improving driving and safety, and saving money on repairs. While this is an early stage startup, Dash is currently exploring various ways to work with brands. * Applicability: Automotive brands and other related industries like car rental companies are immediate fits. As Dash gains users and data, it could present a range of creative options, like a soft drink brand targeting people who go to the beach, or a camera manufacturer offering prizes for people who drive to the most photographed landmarks. * Prominence: Given its early stages, there’s little that’s standardized, so marketers can explore various partnership, sponsorship and advertising opportunities with Dash. * Ingenuity: ODB, and specifically the standard of ODB2 used today, already gives consumers more power to better understand their cars, and insurance companies have done the early legwork of promoting certain benefits (lower insurance rates and increased safety). There are two aspects of Dash that make it stand out from the typical maintenance and insurance use cases: it pulls in many other kinds of data beyond the OBD device itself, and it is exploring ways to turn that data into more social and fun experiences. At CES, Salesforce.com CEO asked, “Why is the car not an app [for mobile devices]?” Dash is offering its own answer. * Value: Freer Logic has developed a brainwave reader called BodyWave that’s worn around the arm, similar to how runners wear MP3 players. By pairing this with specially developed software, corporations can use this to help employees achieve peak performance, increase attention, and reduce human error. At CES, Freer Logic showed how its devices will keep getting smaller, with a model the size of a watch coming soon. It will also expand applications, such as allowing someone to turn on their phone or other objects in their home just by thinking about them. * Applicability: Actual marketing opportunities are too far out. While gesture controls are just starting to gain traction beyond Xbox Kinect (see Leap Motion), having brainwaves as an input likely won’t gain much traction until the second half of the decade. Still, with current customers including NASCAR, NASA, the US military and the US Women’s Bobsled Team, its diverse applications have potential to expand to wider audiences. * Prominence: It is so early that it’s not perfectly clear exactly how brands will use and promote this just yet. * Ingenuity: Other brainwave scanners were at CES, but this one is particularly unique in that it doesn’t attach to the head, so it doesn’t make someone look like they’re a fugitive from a science fiction film or a rejected cast member from “Cats.” These are very early days for brain scans, so expect far more exciting use cases to emerge in the coming years. * Value: GameStick claims to be “the most portable TV games console ever created.” It’s a far cry from the bulk of an Xbox, and the entire system is about the size of the iPhone. The “console” itself is a piece of hardware about the size of a pack of gum with an HDMI plug on the end. The GameStick can be plugged into any TV or large monitor with an HDMI slot, and it comes with a controller that can easily fit in one’s pocket; the controller connects with the GameStick via Bluetooth. GameStick runs on the Android operating system, and hundreds of games should work with it when the device ships this spring. * Applicability: Marketers that have created branded games, especially those running on Android devices, may want to explore if this works for them. Should GameStick become a success, it may attract wider interest. GameStick is already working on partnering with game studios such as Hutch, Madfinger and Disney to add more titles. * Prominence: It’s unclear at this time what the marketplace will look like for GameStick titles, so brands should anticipate needing to promote their titles through other means, especially using Digital Word of Mouth (DWOM®) outreach to engage early adopters. * Ingenuity: This is one of several examples from CES of products built on HDMI adapters. Streaming video device maker Roku offers a Streaming Stick that’s compatible with select television models, and TVF offers its own WiFi-enabled device to bring more digital content to TV screens. Some of these devices are easier to set up than others, and TVs only have so many HDMI slots, so they won’t necessarily become a staple. At their best, they add simplicity and remove clutter from crowded entertainment consoles. With its Android-based platform and hundreds of thousands of dollars raised before its first product release is available, GameStick is offering an appealing alternative for casual gamers. It won’t replace iPhone or Xbox gaming anytime soon, but it may well change how some people play games by making consoles so portable. * Value: This year, Leap Motion is releasing an iPod-sized controller designed to connect with other devices such as laptops to enable a gesture-controlled environment. It can change how people create content, play games and consume media. There is also a program for developers, so any marketer with a vision for how gesture could provide a richer experience for its content and products can submit an idea and request access. The product isn’t out yet, but at a $70 price point for a device that can track individual finger movements down to a hundredth of a millimeter, it’s already capturing the interest and imagination of many who have seen it virtually or live. Certain Asus notebooks and desktops will ship this year with Leap pre-installed, and this is likely a sign of the distribution partnerships to come. * Applicability: Direct marketers can hold off if they’re looking for a hard return on investment. This is only for brands that want to experiment with cutting edge technology with a relatively small but passionate community of early adopters and developers. * Prominence: Marketers that proceed to try out developing for Leap Motion will be able to create experiences that are truly their own, without many other brands competing for the limelight. It’s not clear exactly what Leap’s directory of applications will look like and how exactly brands will be able to promote their wares to Leap’s users. * Ingenuity: Gesture controls are hardly new; Microsoft has already sold tens of millions of motion-tracking Kinects. There are other gesture-controlled devices in development, such as Mauz, which plugs into a smartphone to control a connected computer; it’s now running a funding campaign on Kickstarter. Leap has a head start, generating glowing buzz in the media to attract both developers and customers, while working with manufacturers on distribution. It’s not yet clear whether gesture will become as pervasive an input as touch has in such a short span, but the technology itself is ready and the price point now makes it far more appealing. * Value: Makerbot has developed some of the world’s best known 3D printers that print physical objects. At CES, it released its latest and most expensive model, the Replicator 2X, which retails for $2,800. New features allow for more flexibility with the kind of plastics and use of multiple colors, catering to sophisticated hobbyists and businesses that engage in rapid prototyping. For marketers, at the most basic level, this is the next iteration of a product that should prove to be disruptive for fields such as product development, distribution, and retail, and Makerbot remains at the center of the ‘maker’ movement of builders and do-it-yourselfers. * Applicability: It’s still early for marketers to explore ways to work directly with Makerbot. It could apply to just about any brand, though most will struggle to find an immediate fit. Two possible ways to do so today include setting up the printers at live events to print custom objects for select attendees, or sharing designs for product accessories with the Thingiverse – the community where makers upload their designs that others can print on the Makerbot. * Prominence: Marketers that do find a creative ways to use Makerbot or Thingiverse should be able to command attention from the press, as well as the early adopters in the maker community. Given that this is all about the maker movement, brands that decide to participate will invariably find a way to craft an experience that’s entirely ownable. * Ingenuity: Makerbot continues to earn respect as a leader of the 3D printing field, and it is continually innovating. There is increasing competition though. Rival Cubify launched the CubeX at CES, triggering some comparisons of the two latest models. While the immediate focus of these manufacturers is on improving the quality of their products, in the coming years, prices should start plummeting to reach casual hobbyists and then the mainstream market, following the trajectory of inkjet and laser printers in past decades. To suggest a startup for inclusion in future updates, contact us at startup@360i.com.